I'm not 100% certain if I'm pointing out the sections that @apvermont wants this in. However, I agree that some type of way to either have a dropdown or custom date range in these sections would be useful. If you add a custom range I might even suggest making it two custom ranges making the second range optional. The reason for this would to be able to enter 1/15/18 to 2/14/18 on 2/8/19. This view shows you 30 days about a year ago. The other reason would be able to enter 1/15/17 to 2/14/17 and 1/15/18 to 2/14/18 on 2/8/19. This view shows two sets of 30 days allowing you to compare how many threats you had during similar time frames on two different years. You would obviously have to show one range as one color and the other range as another color so we could see the difference. @apvermont, please correct me if I'm wrong on what you are asking for. First, if you have the GSM Console that looks like this screenshot. I can't tell if it only shows the last 7 days or if like other widgets on the dashboard you have options for 7, 14, and 30 days. If it's the latter, that's useful, but it would be nice to be able to put in custom ranges. 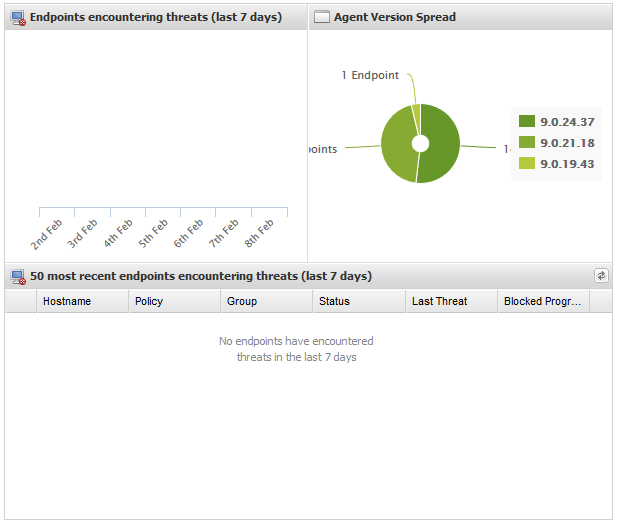 Second, the Endpoint Protection Console looks like this screenshot. It only shows the last 7 days, which isn't a lot of information for us. We don't get hit often and when we do, it's usually a false positive. So, it would be useful if I could see more. However, someone else might get hit often and seeing a smaller range is a good threshold for them. This is why I suggest a dropdown and custom date range boxes. It gives each of us the choice to see more or less depending on our needs.